I need help in locating an instructor/artist, books, tapes, supplies, etc. I am not in a position to travel to Japan, nor do I speak Japanese. I have been searching the web for some time with no tangible results. I will appreciate your time, thoughts, and help with my quest. A: Please join to the local chapter of Netsuke Society. You can meet many netsuke artists at INS convention. Q: I am at a loss as to how my joining a local Netsuke organization would get me any closer to my goal. My primary interest is learning to create Inro utilizing the precise Japanese methods. I have perused the titles of past articles in the International Netsuke Society Journal and found nothing which looked like it would help me with my search. A: You can visithttp://www.toledomuseum.org/Learn_library_Sandfield.htm and go to reference library catalogue to search for something of your interest. When you use search engine, use key words like dento kogei (Traditional craft making) and ningen kokuho (living treasure) instead of inro. Q: I was browsing the web on Netsuke and discovered your information in the International Netsuke Society's listing. I have been trying to find out when and where there might be a good exhibition/show of netsuke in the San Francisco Bay area, California. I am re-entering the hobby of collecting Netsuke. I am looking for individuals that know about netsuke, and have access to them in the Bay Area. I would appreciate having a mentor, or someone that can assist me in finding more about them. Q: Can you help me further identify the pieces shown in the attachments? My background is fine art and I lived in Japan for 4 years, but I need some expert help. The Hotei is 2 inches tall and is signed on the bottom, perhaps Sen Zan? 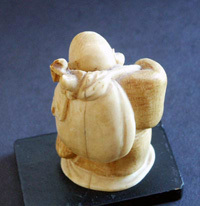 It appears in good condition, but there is a line shown along the back and on the bottom that appears to have been part of the original condition of the ivory. Can you give me an idea of the date and the value? The rickshaw carving appears to me to be of 'tourist' quality and of little value. The store label is included in the attachments. Thank you very much for your assistance. A: There is not netsuke carver, Sen Zan, in The Meinertzhagen Card Index on Netsuke in the Archives of the British Museum. Art dealers use that index to verify authenticity of signature on netsuke. Q: Perhaps you may be able to assist me by providing some information. I have recently purchased a netsuke of a Noh actor by a well-known 20th century master carver Isshu and another of a canine beast by Meigyokusai. Do you have any information you can email me about these artists, or you might know of some internet links? Brief biographies, carving schools, common subjects, exhibitions, etc.? Anything will be of assistance. A: Meigyokusai is a famous contemporary netsuke carver. His name is in Miriam Kinsey’s Comtemporary Netsuke-Page 185. To the Netsuke collector, the name of Meigyokusai is synonymous with expert workmanship. strong and usually traditional design, and great versatility. Meigyoku Hiragana.Born 1896 in Tokyo; later moved to Kyoto, where he now resides. Tanetoshi studied under Shogin, whose carving lineage goes back to Gyokuzan. He is very versatile in both technique and subject matter. He often draws upon old classical designs for his subjects, but original designs, like his twelve animals of the zodiac netsuke, are outstanding. Tanetoshi received prizes for carving before he was twenty five. He is famous not only for his skill as a netsuke carver but also as a Senryu poet and teacher. His original designs are strong and pleasing and follow traditional netsuke form. He rests one day a week and spends that time visiting temples and shrines and attending Senryu meetings.